A personal journey from joint pain to joint health! Joint Pain runs in my family ---- my human family and my critter family!! Mostly knee pain, but the fingers as well. And to add to my knee and hip pain, i have been riding horses most of my life, which has added lots of extra stress. And then there is gardening and house keeping..... I know you can relate!!! Can't wait to hear about the solution? ALL products carry a Money Back Guarantee, from the finest nutrition company in the world (AND the Leader in Green Products & Green Business)!! And, with membership, I pay half the shipping, and give an additional discount. Additional special discounts apply to certain products. Attending Colorado State Univ. we showed our horses a lot. Sort of like making a movie, it's ''hurry up and wait.'' 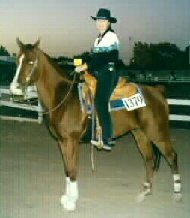 Sitting on round horses in big western saddles finally did me in; the bursitis in my hips got so bad that a round of cortisone shots into the hip joint was necessary... Joint Pain---OUCH! Continuing to suffer with joint pain throughout my 20s and 30s was no fun, but there was too much life to live to let it get me down. Taking a Lecithin supplement and an Omega 3 Fish Oil really helped with the bursitis in my hips and shoulders, but there was still a lot of pain. WOW WOW WOW, within just a week or so, I was able to bend down and GET UP WITHOUT HELP from a chair or counter etc....... a MIRACLE!!!!!! It had been a very long time since this simple act was possible. My joint pain is MUCH Less, and YES, it's still working today!!! All the critters and I love the Fabulous Amazing pain cream -- just used it last night on cattledog Zahdy's sprained ankle... she's not lame at all this morning! My hubby Tom, along with 2 of our old canines, use the revolutionary pain tablets... NOT a drug with many side effects, but an all natural formula that includes Frankincense; when I crush the tabs for the doggies, it smells incredibly good!! Boswellia is an herb used successfully in India for thousands of years, and the Biblical incense frankincense was probably an extract from the resin of the tree, Boswellia sacra. How do we know all of this works? Only humans have the ''placebo effect.'' No fooling a dog or horse or mule--they just KNOW it works; their joint pain is nearly nonexistent! Not only is Fish Oil great for cardiac, vascular, and general health, but it is amazing for joint health! It contains omega-3 fatty acids--- eicosapentaenoic acid (EPA), and docosahexaenoic acid (DHA). These are what are called Precursors to eicosanoids; they help reduce inflammation in your entire body, and really help those joints!!! You already get some chondroitin from your diet. It is found in most animal tissue, chondroitin is simply “gristle” found around joints and in leaner cuts of meat. The chondroitin most used commercially is bovine cartilage or cow trachea. Some companies claim shark cartilage will also do the job. Still others use chondroitin sulfate which is a cartilage extract. The problem with all of these is that chondroitin (“gristle”) is too large a molecule to be absorbed whole. It is broken down and digested as it passes through the intestinal tract. Even with the smallest molecules ever developed of a very purified chondroitin sulfate, only 3 to 8 percent is absorbed. On the other hand, glucosamine is about 98 percent absorbed. There have been no valid studies showing that giving chondroitin orally is of any value for osteoarthritis. The only positive studies are those where chondroitin was given by injection into the joint. ‘Several studies testing the combined effectiveness of glucosamine and chondroitin are NOW being conducted. WHEN the results are announced, there will undoubtedly be more glucosamine/chondroitin combination products on the market.” I capitalized two key words in the text for emphasis. When this book came out in early 1997, Dr. Theodosakis said tests were being conducted. It is now late 1998 and no valid studies have been accepted for publication supporting oral chondroitin. The bottom line is that chondroitin is totally ineffective as a pill because it is too large a molecule to be absorbed whole. Like any other “gristle,” it is digested as it passes though the intestinal tract. Therefore, to be effective, it must be injected to bypass the stomach. Chile Pepper, my rescued Pitbull Terrier, had TPLO surgery on both of his stifles (knees) in 2000, which allowed him to run and play and go horseback riding with us. Joint pain is a real problem in the Canine World... However, it atrophied his rear end muscles, and caused joint pain & arthritis... but this same Complex to the rescue.... he is able to come riding with us 3-4 times a week, even in his ''old age'' of 12+. Read Chile's complete story on All Creatures Animal Stories. 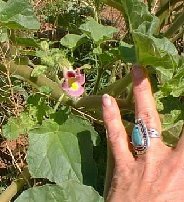 And i can ride my darling horse Rhett--Baskips Amarhetto-- again! He was plagued with joint pain issues from the time he came into my life at age almost 5. We Reined, and that put tons of stress on him!! Dell Hendricks was one of his main trainers 1993-95, and being a large man and Rhett a smaller horse, well you get the idea... Rhett learned to be excellent, but the added weight did have long term consequences. Dell is today one of the top NRHA reining trainers in the world. We did many treatments---acupuncture was one of the most effective, and a couple of vets did injections and other treatments...... but Honestly---the Joint Complex has been THE MOST beneficial of all (and that Organic Liquid too???)!! Read Rhett's joint pain story HERE. This is a photo of Tyree (Hickory's Smart Tari) doing his Self Acupuncture treatment with Cholla Cactus! 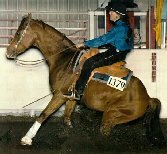 Tyree was a flunked NRHA reiner, but Joint Pain Complex ''cured'' him too!! 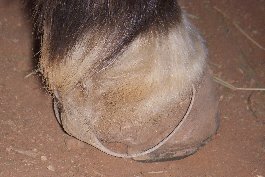 The horse shoer was here 1 week ago, and he commented on how well Tyree was tolerating standing for his rear shoes; for the first time, he showed no pain, was much more flexible, and he stood as long as necessary! OK OK, enough of the anecdotal evidence.... here's the science! !